If you’re looking into how to seal marble countertops or floors, you might be looking for the best product to get the job done. We’ve got you covered! We’ve done all the research to present you with the top ten marble sealers on the market right now. First, let’s jump into what you should look for, and afterward check out our amazing list of marble sealing products to keep your stone looking great! Application Method: There are a few different ways that you can apply a sealer, and most sealers can be applied in any way you prefer. Still, we’ll tell you what type of container it comes in and what the company prefers! Package Size: How much are you getting? This is important depending on the amount of marble that you need to seal. Don’t buy a gallon if you have a small area, but also don’t buy less than you need for your surface. Water Based: Water-based sealers don’t have as many harsh chemicals as sealants that are based in petroleum and other chemicals. They are also more prone to being food-safe than polymer-based sealers, but we’ll let you know here. Finish: The finish can make all the difference on your countertops or floors. Some sealers finish with a high gloss, while some are matte (meaning they don’t change how your marble looks). Choose the one that you prefer! Food Safe: Is the sealer food safe? Most of them will be after a certain amount of time has passed after application. Still, it’s better to be safe than sorry, so we will tell you here if they are or not. Streak Free: Streak-free application is the norm for most of these products, which basically means that it’s going to dry clear, without any streaks from whatever application method that you used. This is important to keep your home looking great. Let’s get right to our best marble sealer reviews. We want to bring you only the best, so we reviewed a ton of the marble sealers that are available on the market right now. Our top pick and budget picks are our personal favorites and the highlights of our list, so check them out first. Don’t forget to read to the end of the list, though! You might find what you’re looking for there. Stella Sealants makes this Ultra Dry 70 formula that works wonderfully. 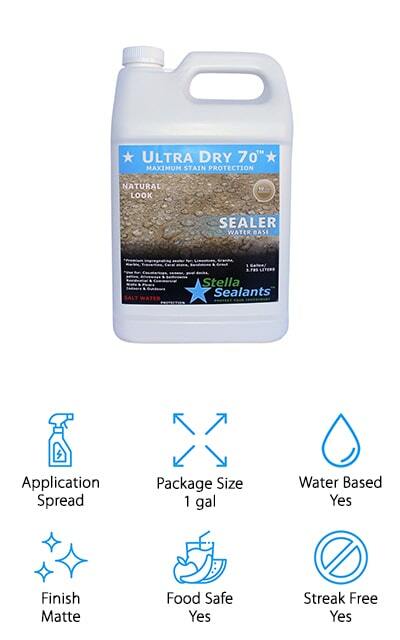 Just like you would expect to find in a Dupont marble sealer review, Stella’s Ultra Dry 70 affords you the maximum stain protection that you can get in a sealant. It works in natural stone, marble, granite, and even limestone to keep your expensive floors, countertops, and showers looking their best. It’s easy to use, water-based, and safe to use around food after the application has dried. It even works for saltwater protection, and that’s saying something! It doesn’t at all change the natural look of your marble, providing you with a matte finish that keeps moisture away from the stone. It works on travertine stone and a bunch of other applications as well, so make sure to look into this sealer to see if it will work for you! You aren’t going to regret it, and your surfaces have never looked better. 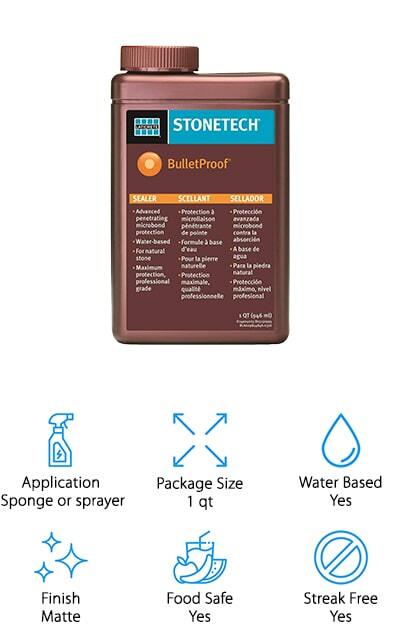 When you’re sealing your marble on a budget, you should try out the StoneTech BulletProof Sealer. This one-quart package can cover up to 100 square feet and make sure that it’s protecting against stains on your natural surfaces. This is an extra-strength formula that seals off all natural, porous stone and grout. It’s made with water-based fluoropolymers that help to protect your marble and other natural stone surfaces for up to five years. When water stops beading on the surface of your counter or shower, you should look into resealing it. Apply liberally to accomplish a complete seal that won’t lead to any water stains. 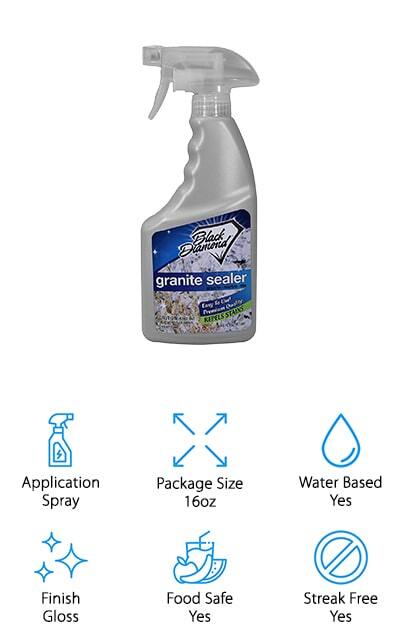 Also, this sealer won’t clean stains that already exist, so make sure that you’re cleaning the marble or stone surface with a specific cleaning agent first so that you get the most out of your sealing application. You can spray this stuff on our spread it with a sponge for the best results! Tri-Nova makes this amazing professional marble sealer that uses a more powerful blend of polymers than most of the other sealers on this list. It penetrates the stone’s porous surface in order to stop stains from becoming a permanent part of your marble. It also becomes a glossy, protective layer on the top of your marble to make it shine. Water will bead on top of the sealer no matter if you’re using it on grout or granite. 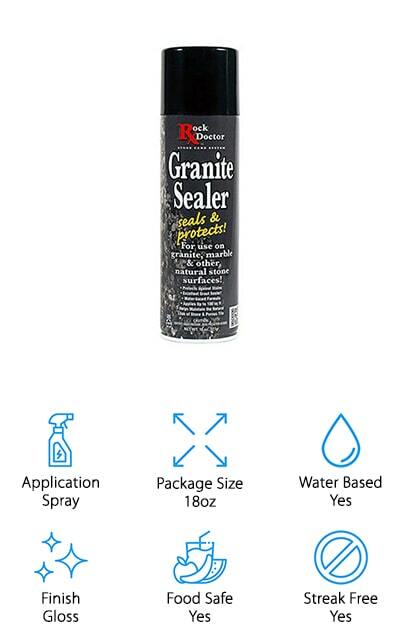 Nothing will stick to your floors or countertops with this sealer! Prevent your grout from discoloring by using a sealer such as the amazing Tri-Nova to seal off your marble and preserve the brand-new look of your marble fixtures. It’s a long-lasting formula, and you can start using it right when the previous seal is no longer resisting water. 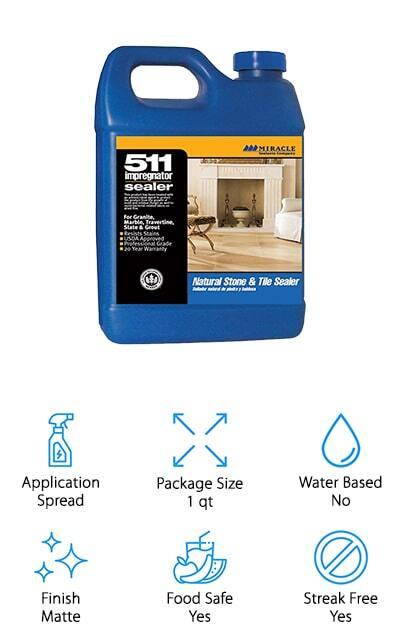 This 511 stone sealer by Miracle Sealants comes in one-quart containers, so keep that in mind when you’re ordering. A gallon will cover about 1,000 square feet of marble, so you will need to know how much marble you will need to seal. For the best results, you need to seal your entire marble surface at the same time, so make sure you have all the materials you need before you get started. You can use this indoors and outdoors. It’s weather and UV resistant so the areas around your pool or hot tub won’t be damaged by rain or degraded by the sun. You can use it on your inside and outside bars, as well as your marble countertops, to make sure that nothing can seep down and harm them. It’s a powerful sealer that isn’t water based like most of the others on this list, so use gloves during the application process to avoid damage. 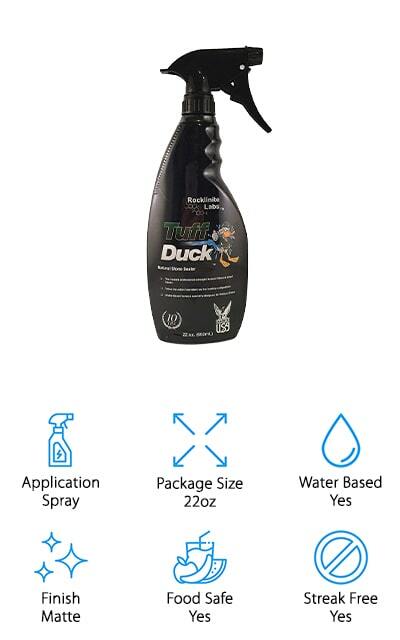 Many who have experience in the marble industry liken this Tuff Duck sealer to the popular Carrara marble sealer at a much more affordable price. It comes in a 22-ounce spray bottle so that you can easily apply it where you need it. The company recommends that after you spray the product, wipe it down with a sponge or other cloth to make sure that it’s spread evenly and without streaks. It has twice the active ingredient as some similar brands so that you get all the protection you need with a single coat. Interior surfaces will be protected up to five years while exterior surfaces will likely need resealing after about 3 years. It’s a non-acidic, water-based formula that will cover about 800 square feet with a single bottle. Make sure you’re buying enough before you get started! This sealer will work on granite, grout, travertine, slate, and even concrete, among others. It’s got a beautiful matte finish! This marble sealer by Rock Doctor gained its place on our list because of the way it treats grout. If you need a water-based sealer that’s going to treat the areas you use water around perfectly, then take a look at this. One 18-ounce can of Rock Doctor can seal about 100 square feet of natural stone surfaces. It bonds with the stone on a deep level, by seeping into the porous surface to provide a natural barrier against the elements, moisture, and anything else that’s going to harm your marble. It will work on all of your natural stone and comes with a spray valve to evenly apply the product. You should wipe it down afterward to make sure the application is complete and that there are no streaks left on your marble. This adds a beautiful gloss finish that will make your marble really shine, and nothing is going to stick to it, either. 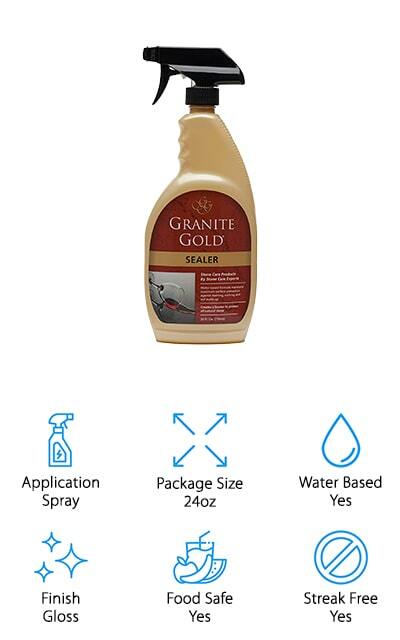 Granite Gold is one of the best sealers on the market right now. It creates a barrier on top of your stone surfaces that won’t allow stains from oil, water, or any other liquid to seep through. It will also prevent soil build-up for your exterior marble or etching to occur with wear. You can use on countertops and showers, and it will protect all of your surfaces. You only need to spray the sealer on your surface and wipe with a lint-free cloth to spread. You will need to use 2-3 coats to completely seal the marble, and you should wait 20 minutes between applications. It’s non-toxic, non-acidic, and doesn’t contain any of the harsher chemicals. Plus, it’s biodegradable and food-safe, so what more could you ask for? You’ll get 24 ounces of sealer with this order that you can use on the exterior and interior marble fixtures in your home. You won’t regret it. Hands down, the best marble sealer for shower use is Black Diamond’s Nex-Gen Sealer. 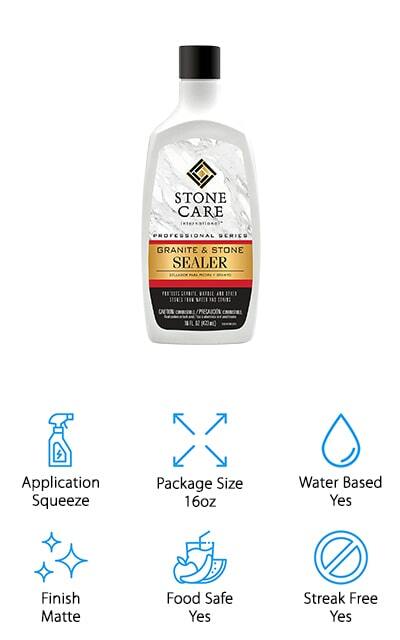 It’s a non-toxic and non-corrosive sealer that works to protect your granite and other natural stones surfaces from liquid stains, oil, grease, and even germs. It’s safe for use with food and you can use it on your exterior and interior marble. It has a low-odor formula when compared to some of the other sealers on the market, and it’s great for concrete, grout, and stone. For the best, professional results, you should spray down the area you want to be sealed, allow it to penetrate into the stone, and then wipe off the excess for a streak-free gloss that’s going to look great on top of your natural stone. It still allows the stone to breathe, which is one of the best parts about this sealer. It’s probably one of the least-harmful formulas that we looked at during our research, and that’s pretty amazing. Tenax Proseal is made in Italy and is safe on all stone surfaces. It will help to rejuvenate your stone, giving you a great glossy finish on top of your already beautiful natural surfaces. 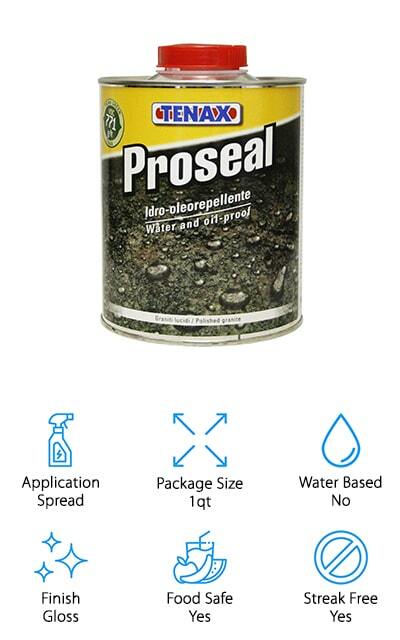 One liter of Proseal allows you to completely seal between 200 and 300 square feet, and this is a single quart. Make sure you order all that you need at once! Clean your marble first, then spread the sealer on with a sponge or cloth. Once you have given it time to penetrate and settle, wipe off the tacky excess to give yourself some beautiful and safe counters. Apply the sealer evenly to your terrazzo, concrete, limestone, and even engineered stones to achieve the best finish and one of the most effective seals to prevent water stains and other damage. If you want your stone to look like it is new again, this is the sealer that you want to go with. Lastly, we have Stone Care’s International Sealer. You can use it on marble, granite, quartz, and all other naturally porous stones to achieve a matte finish that won’t’ affect how the surfaces look. It’s a streak-free formula, and by the end of your application, you’ll have a beautiful natural surface that you know is well-preserved against stains and damage. 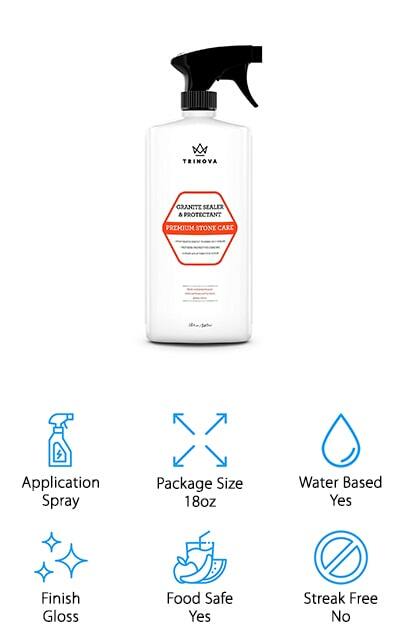 This 16-ounce package is ideal for covering about 48 square feet, so make sure that you’re using enough product to get the formula to penetrate. It’s a streak-free formula so your counters should look amazing again! This sealer is food safe and should be used every six months for the best results and the most complete seal. You definitely want to protect your investment, whether you’re using the sealer on the inside or the outside for your marble. Don’t let it get damaged beyond repair when you can seal it properly with Stone Care International Sealer!